Mary-Kate is the Abominable Snowslut? 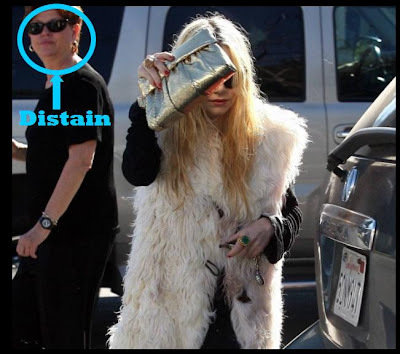 Mary-Kate Olsen was out and about in LA dressed like the Abominable Snowslut. I actually feel bad for the Abominable Snowman who is probably running around naked right now after being skinned-alive by Mary-Kate. And how in the hell can she get around with that purse in front of her face? She officially looks crazy, which typically I love but in this case I think I would have to throw a net over her and toss her in a van if I were to see that stumbling up and down the street. Hasn’t she learned anything from that episode of Full House when DJ didn’t eat for 3 days so she could fit into her bathing suit for Kathy Santone’s birthday pool party? Maybe Mary-Kate shouldn’t have been focusing so much on saying, “You got it dude” and focused more on DJ starving herself. Jeesh! Kids.